Winning the Information War - CEPA STRATCOM PROGRAM. As revisionist, autocratic states like Russia sharpen their use—and abuse—of disinformation, liberal democracies are failing to keep pace. The Kremlin’s use of information as a weapon is not new, but its sophistication and intensity are increasing. Belatedly, the West has begun to realize that disinformation poses a serious threat to the United States and its European allies, primarily the “frontline states”—Poland, the Baltic states, the Czech Republic, Slovakia and Ukraine—but also to Western Europe and North America. How has Russia’s pollution of the information space shaped international discourse on alliances, organizations, public institutions and mainstream media? What can be done to filter these digital toxins from our democratic system? “Winning the Information War: Techniques and Counter-strategies to Russian Propaganda in Central and Eastern Europe”is the latest report from CEPA’s Information Warfare Initiative. 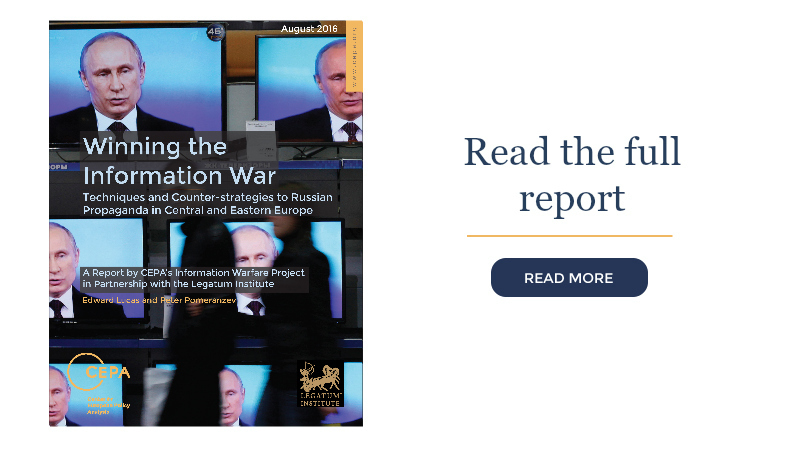 Conducted in partnership with the Legatum Institute, it analyzes the impact of Russian disinformation by drawing on dozens of case studies, some directly commissioned by the authors and others detailed by on-the-ground monitors. Project chairs Edward Lucas and Peter Pomerantsev synthesize those works and analyze the tools of Russian information warfare—overt propaganda channels as well as the political forces, civil society actors, businesses and public figures who use them. The report also looks at several examples of policies Russia has enacted to spread disinformation throughout Central and Eastern Europe. 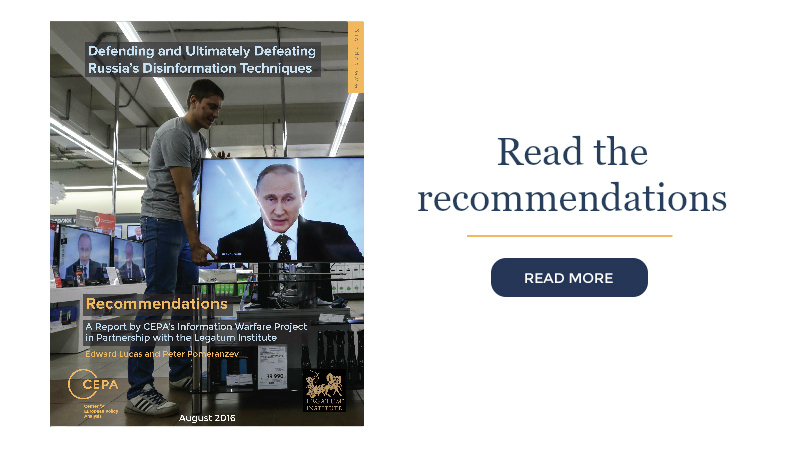 Winning the Information War concludes with a comprehensive set of recommendations— also produced as a stand-alone report—to defend against and ultimately defeat Russia’s disinformation machine.